Majestic’s Michael Panuccio (right) fits Mookie Betts for a uniform, while his assistants carefully take down sizing information. FORT MYERS, Fla. — Baseball is a game of inches, and no one knows this better than Michael Panuccio. Panuccio has fitted more major league uniforms than anyone on earth over the last 15 years. “Actually, I’m not a baseball fan,” says the bespectacled, 57-year-old manager of patterns and marketing at Majestic Athletics, which supplies the uniforms for all 30 major league teams. On a recent March morning, Panuccio heads to Red Sox camp at 5 a.m., armed with two assistants, two laptops, and a dozen T-shirts, with their sizes printed on the front. By 6, he is open for business in the Sox clubhouse. For the next 2½ hours, he is a blur of movement, fitting 65 players, coaches, and even David Ortiz’s switch-hitting son D’Angelo. “So he can be just like his dad,” says Panuccio. This is not off-the-rack stuff. Ortiz, who looks thinner this spring, nonchalantly tries on a pair of pants right in front of the two ladies writing down sizes and specifications. One enters information into a computer while the other writes the instructions into a ledger, just to make sure everybody hears the same thing. Ortiz is pleasant, polite, and has on long, skin-tight workout pants. Panuccio wears blue jeans and doesn’t tuck in his shirttail. Ask him if he’s a tailor, and the native of Easton, Pa., gives a long answer. 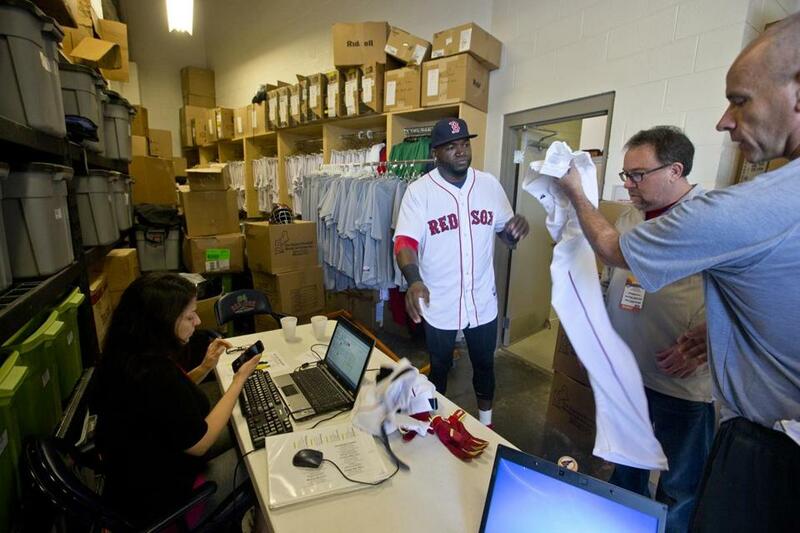 David Ortiz (center) went through the fitting process with Michael Panuccio. He rarely uses a tape measure. He doesn’t need it. Clubhouse manager Tom McLaughlin has every uniform at his fingertips, and last year’s models have tags with the waist size, pant size, and instep. That is the starting point. Panuccio can eyeball a player and immediately pick the right size, but that’s not important, he says. Better to give a little more room than to restrict movement. “If he looks good and he feels good, he’s going to play good,” says Panuccio. Some fittings take longer than others. Right fielder Shane Victorino missed most of last year with injuries. His eyes bulge like a Little Leaguer’s when he finally gets to don his dress whites. “If you look at Victorino, he’ll have customizations, he’ll have knee pads and sliders,’’ says Panuccio. Other players have different needs, some practical, some fashion-influenced. And just as in the fashion world, the whole thing is cyclical. Now the baggy, pajama-type uniform is falling out of favor. The Red Sox are probably showing less red sock than in the past. “Players are wearing them longer today, putting them down by their cleats,” says Panuccio. Pitchers are more sensitive to their uniform tops than other players. They may want more room in the sleeve of their pitching arm to give them more range of motion. “The least distraction, the better off it is for the players when it comes to the uniform,” says Panuccio, who estimates that 30 of the 40 Red Sox roster players will have customizations. Does that make them prima donnas? This time of year, all 30 teams get measured by four Majestic fitters in Arizona and Florida. Then the sewing machines start humming in the Majestic factory in Easton. “This year, we’ve customized 1,176 pants for Major League Baseball,” says Panuccio. His pattern library has 800 jersey patterns and 4,200 custom pants. Big leaguers still put on their pants one leg at a time, but some things have changed, according to Panuccio. On average, players are a half-inch taller than they were in 2000, and they have different bodies than most mortals. Ask him about a specific player, though, and he becomes as quiet as a needle stuck in a ball of yarn. He has stories but he won’t name names. He cites confidentiality agreements. Plus, everyone knows snitches get stitches. Recently, one ballplayer was unhappy, and his team’s equipment manager made an urgent call. Panuccio jumped in his car for a 3½-hour drive. Many players also are superstitious. Majestic guarantees quick product delivery because they are made in the US. Sometimes a superstar will be offended because Panuccio doesn’t recognize him. This can lead to some pranks. Slender Chicago White Sox outfielder Kenny Lofton once told Panuccio he was No. 35, which in fact was Frank Thomas, the Big Hurt. Panuccio did the fitting, and when Thomas showed up later, Panuccio told the future Hall of Famer he had already been fitted. Then he spied Lofton, who was 60 pounds lighter, cracking up in the background. “The joke was on us,” he says. But other things are no joke. Some players complained about a possible “Shrinkgate” with their road uniforms. “The players will tell you that their grays will fit smaller than their homes,” says Panuccio. The chief suspects are equipment managers using higher drying temperatures to get finished faster after late games. “We don’t know for sure,” says Panuccio. Ballplayers are also fans of the much-maligned polyester, which Majestic uses in its four-way-stretch uniforms. When Panuccio returns to the factory in Easton, it’s not over till it’s over. He worries about the aesthetics of placing names properly on the backs of uniforms. Some long names, such as former Red Sox catcher Jarrod Saltalamacchia, create headaches.